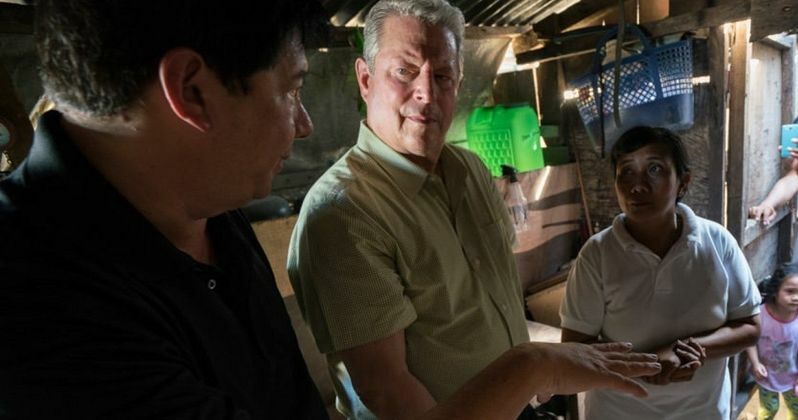 Nearly 11 years after the powerful Oscar-winning documentary An Inconvenient Truth hit theaters, former Vice President Al Gore returns to spread awareness of climate change even further in the highly-anticipated follow-up An Inconvenient Sequel: Truth to Power. During Paramount's CinemaCon presentation today, the studio released the first trailer for this documentary sequel, which will hit theaters nationwide on June 28. This trailer also includes footage from President Donald Trump's campaign rallies, where he promises to put an end to the Environmental Protection Agency, at a time when we very well may need it the most. A decade after An Inconvenient Truth brought climate change into the heart of popular culture, comes the riveting and rousing follow-up that shows just how close we are to a real energy revolution. Vice President Al Gore continues his tireless fight traveling around the world training an army of climate champions and influencing international climate policy. Cameras follow him behind the scenes, in moments both private and public, funny and poignant, as he pursues the inspirational idea that while the stakes have never been higher, the perils of climate change can be overcome with human ingenuity and passion. Stepping beyond the limits of the first movie's focus on Gore's inspirational slide presentation, the new film travels the world and delivers an inspirational story of change in the making. Participant Media presents a film featuring Al Gore, directed by Bonni Cohen and Jon Shenk. An Inconvenient Sequel: Truth to Power is produced by Richard Berge and Diane Weyermann and executive produced by Jeff Skoll, Davis Guggenheim, Lawrence Bender, Laurie David, Scott Z. Burns and Lesley Chilcott. Davis Guggenheim directed the original documentary, which won Oscars for Best Original Documentary and Best Original Song, for Melissa Etheridge's "I Need to Wake Up." Paramount Pictures has handed out a June 28 release date for this documentary sequel, which will go up Sony's Baby Driver, which just moved to this summer release date a few hours ago. This documentary will also be sandwiched between a few high-profile projects. Five days before this release, Paramount will debut their highly-anticipated Transformers: The Last Knight on June 23, and two days after the release, it will face Universal's animated comedy sequel Despicable Me 3, along with Warner Bros.' comedy The House, The Weinstein Company's thriller Amityville: The Awakening and Broad Green Pictures' Wish Upon. The original movie An Inconvenient Truth brought global warming and climate change issues to the forefront of pop culture, earning $24.1 million domestically and $49.1 million worldwide, which may not seem like much, but they're big numbers for a documentary. Paramount hasn't revealed how wide a release An Inconvenient Sequel: Truth to Power is getting, but with climate change more relevant than ever, thanks in part to President Donald Trump's controversial comments about the EPA, this film may have an exponentially bigger audience this time around. Take a look at the first trailer for An Inconvenient Sequel: Truth to Power.